Welcome to the Prairie Schooner Taphouse, a micro(ish)pub and bottle shop in Urmston named after the wagons covered in sailcloth which crossed the American West in pioneer days. We specialise in real ale from local microbreweries on our four hand pumps as well as eight craft kegs. We also have a selection of traditional cider, fine wine, fizz, single malt whisky, small-batch gin, vodka and rum plus old-fashioned soft drinks which are all made by independent producers. We have a large selection of American, Continental and local bottled beers on our shelves to take away, or you can take a relaxing tipple in our drinking parlour free from loud music and sports TV. See what’s on tap or Twitter or download the RealAleFinder app. Find our calendar of events on Facebook for details about our weekly quiz, tutored tastings, live music nights, DJ sessions and Bring Your Own Vinyl. Four hand-pulled real ales. Usually local and always changing: we often have casks from Blackedge, Dunham Massey, Howard Town, Marble and many other local breweries from the burgeoning Manchester beer scene. You can find out what’s on tap through our updates on Facebook or Twitter. Eight craft kegs on tap. We’ve added to our keg offering again to make room for two more taps. You can rely on us serving Hogan’s draught cider, local IPAs from the likes of Runaway, Seven Brothers etc plus whatever else takes our fancy (fruit beers, saisons, sours…). We have dedicated fonts for American and Belgian imports (Anchor, Brugse Zot, Chimay, Sierra Nevada etc). Outstanding Beers of Salford make a cracking Continental-style pilsner which we serve in custom-made glasses. Outstanding’s Stout is superb as well. Bottled & canned beers from around the world & from around the corner. Although we work direct with as many local producers as possible, we also offer many fine Continental and American beers too like Anchor, Augustiner, Brussels Beer Project, Dry & Bitter, Evil Twin and assorted Trappist brews. Select a few from our shelves to take home or crack open a cool one in our drinking parlour. We stock nearly 100 British beers and over 30 imports. Most of these are on our off-licence shelves, with about 30 different chilled ones in the fridge; you are welcome to ask for any of these to be opened for you to drink on the premises (a 50p corkage applies to bottles from the shelf while menu prices apply to bottles from the fridge). We welcome special orders plus offer vouchers and gift boxes. Cider, perry & fruit ciders. We have Hogan’s Ciders on draught and bottles from the likes of Dunkerton and Manchester’s own Moss Cider. All as traditional and natural as possible. Wine & fizz. A small but choice selection, by the glass or by the bottle. The Argentinian malbec and Marlborough sauvignon blanc are particularly popular. Whiskies. Only from true independents like Springbank, Kilchoman and Arran, mainly from distilleries we have personally visited ourselves. Small-batch gin, rum and vodka. We stock a gin from all the Manchester distilleries (Faith & Sons, Three Rivers, Manchester, Three Rivers & Zymurgorim) plus Macclesfield’s Forest Gin and Monkey 47. All are served in balloon glasses with Fever-Tree tonic as standard. Faith & Sons vodka, Rebellion white rum and Admiral J’s spiced rum round out our spirits selection. We sell all our spirits by the bottle to take home, POA. We sell all our wines and spirits by the bottle, so if there’s anything on the menu you particularly like we can send you home with a bottle at our off-licence price or specially order a case for you at a 10% discount. Gluten-free and low-alcohol beers. From Brew Dog, Jever and Estrella. Soft drinks. A large range of traditional Fentimans flavours, sugarfree Fritz cola, fruit juices, ginger ale, lemonade, cordials and sparkling spring water. Nibbles. Traditional bar snacks including Fiddler’s crisps from Lancashire and Cleaver & Keg meaty morsels as well as luxury mixed nuts, bombay mix and sweets. Our ‘meet the brewer/distiller’ nights, brewery takeovers and other events are announced on Facebook and Twitter. Let’s Get Quizzical on Tuesdays with quizmaster Rob. Prizes for the teams with the highest and lowest scores, plus everyone has a chance to win the rolling cash jackpot. £1 per person entry, maximum six players per team please. Between 8-10pm. Every First Wednesday: Urmston Brew Club. Thirsty Thursdays. 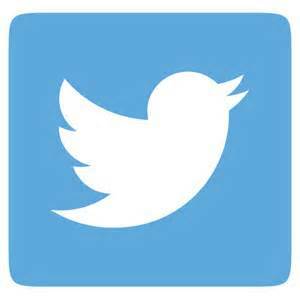 Follow us on Facebook or Twitter to hear about live music, street food or tasting events, often with brewers or distillers on hand. Bring Your Own Vinyl on 2nd and 4th Thursdays, hosted by Dave Garland of Music For The Soul. Bring a record to share on our turntable, or take your pick from Dave’s selection. Theme nights are announced on Twitter, but you’re welcome to bring any music you want to share. Meet the brewer at our tap takeovers. So far we’ve hosted Seven Bro7hers, Brightside, Brewsmith, Tweed, Cryptic Ales, Hophurst, Poynton, Tatton, Blackedge and Magic Rock. These often coincide with the Urmston Brew Club. We’re members of the Urmston Partnership and every so often you’ll find us selling bottles around the corner in Eden Square alongside other artisan food & drink suppliers. We also take bottles and cans to Urmston’s Artisan Market on the first Saturday of every month. Do you belong to a book club or other group looking for somewhere to meet? Planning a birthday or other celebration? Contact us in order to reserve tables for group bookings. We are NOT able to hire out the entire premises any further. We’re at 33 Flixton Road (on Urmston’s high street) between 72 Tattoo and Urmston Carpets. We hope all of our customers will walk, cycle or take public transport to reach us. Plan your journey using the travel tools at Transport for Greater Manchester. We are a few doors down from Urmston train station which is on the stopping service that links Manchester Oxford Road & Deansgate stations with Liverpool Lime Street. To reach us by train from Manchester Piccadilly, you’ll need to take a connecting train to Oxford Road station. Buses on routes 15, 22, 23, 245, 255, 268, 276 and 278 all stop nearby. We have no car parking spaces at our premises. The private lane to the side needs to be left clear for deliveries and our neighbours, so please don’t pull in or try to park behind our building. On-street parking along Flixton Road is limited to 2 hours until 6pm Monday-Saturday. There is a large multi-storey car park behind the Eden Square Sainsbury’s off Croft Bank’s Road which offers three hours of free parking during the day and is free after 6pm. Accessibility. There is one 6-inch step into our premises (no handrail). There is a buzzer to ring if you need assistance; we have a portable ramp we can bring out. There is a fully accessible WC on the ground floor. To get in touch, send an email using the form below. We’ve had a few mentions by Manchester’s Finest in print and online, praising us for both our bar element and burgeoning bottle shelves. They rate us as one of Manchester’s Best Booze Shops and also say ‘If you’re thirsty – this is the best place to come in Urmston by far.’ We’ve been named one of TimeOut’s Ten Great Manchester Beer Shops. 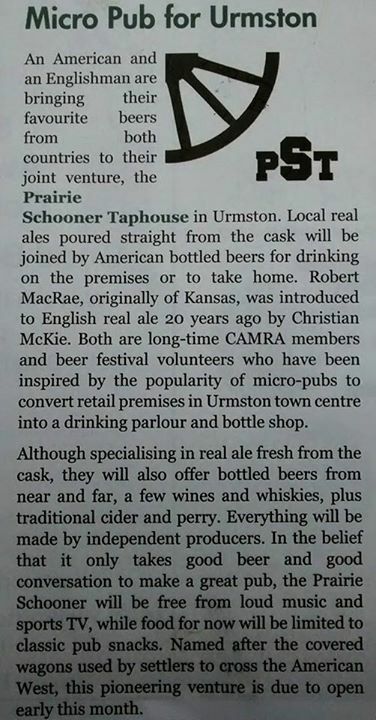 After hosting a meeting of the local Trafford & Hulme CAMRA branch, we were featured in the December 2015 edition of the Opening Times. The local Trafford & Hulme branch of CAMRA voted us runner-up best newcomer for 2015. We’ve also been featured on the Urmston Independents blog and have been profiled by the Manchester Evening News along with several other independent businesses in the neighbourhood. Here’s our press release for the September 2014 edition of the local CAMRA Opening Times, the copy for which had to be finalised a month ahead which is why it was a bit off the mark with regards to our opening date. Never mind, we got there in the end. Another preview piece appeared in Manchester Confidential in October 2014, again before we opened and still had a prototype of our logo floating around on the interwebs. For all the media coverage, we’re most interested in hearing what our customers have to say which is why we’re on TripAdvisor. We welcome your reviews there and on Facebook as well, along with the Micropub Association, Beer In The Evening and Pubs Galore.